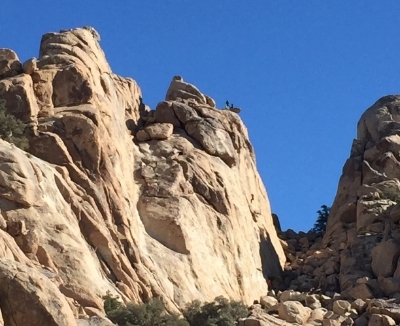 If you look carefully, there's a young woman scaling the face of that rock and I can only imagine what brought her there, what will get her to the top. Inner strength, determination, and courage - we all draw upon our resolve especially at the beginning of the year as we set our resolutions, intentions, and goals. I am not going to be rock climbing at Joshua Tree any time soon although I will need resolve to get me where I want to be with my health, with strengthening my body. I am going to need resolve for changing habits, or more important changing the conditions that set up habits. Resolve - n. a firm determination to do something. Latin roots of, to loosen, which I love when you think in relation to habits or tendencies. Our habits can bind us, our resolve can free us! Be specific - describe in detail what your goal entails. The time of day, the duration, the specific result you are seeking. Write this commitment down, in a way that you can carry It with you, mentally and physically. Imprint it in your schedule so there is no chance you will forget ... or ignore. Plan for success, Think ahead, plan each day. What is going to create space in my day for this? Is there anything I need to reprioritize? What might get in the way? And then make the necessary adjustments because you want this - this is your winning ticket! Tell someone - select carefully because you want this person to hold you accountable. You are not going to be tempted by distraction with this person on your side, who is creatively tuned to your personal challenges. Reflect on why this is important for you. What do to have to gain by following through? What do you have to lose? And what is important about each? Recent neuroscience studies have made some very favorable discoveries. The patterns in our brains can be changed, they are pliable and can be shaped into new patterns with repeated effort. Just like a well worn hiking path that for years has directed you from point A to B, you can forge a new path in the brain, literally. The neurons that fire together when you make a choice, or set an action, repeated over time will wire together. With practice your tendency to reach for the sweetest, largest desert falls away and you actually prefer that perfect pear or juicy tangerine. This year I resolved to have a disciplined training program after 6 months of inactivity. And that first week saying this out loud, imprinting my intention in my mind, did help get me to the gym when I felt the pull to be elsewhere. And then life happened; surgery for the dog, injections for the hip, then that nasty chest cold going around, so I found I did need resolve, a resolve of patience and acceptance. That was my training for January. It's been just over a month into 2016 and not too late to reset your efforts. This could be the year of the big win. Is there anything you would like to share about resolve, habits, or making changes? I encourage you to comment below and go public. Make your most important aspirations real - now is the time, and you deserve it !